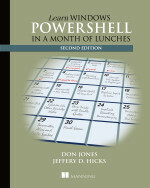 Today, Learn Windows PowerShell 3 in a Month of Lunches is part of Manning’s Deal of the Day. This is the book for the absolute beginner and will teach you literally in a month of lunch breaks all you need to know to get started with PowerShell 3.0. Not convinced? Take a moment to read the Amazon reviews. Even though you can probably get a good deal at Amazon, the Manning Deal of the Day is only good through their store. So visit the book’s page and use promo code dotd0404au when you check out to save 50%. By the way, this promo code also applies toÂ Learn Windows IIS in a Month of Lunches by Jason Helmick (http://www.manning.com/helmick/).